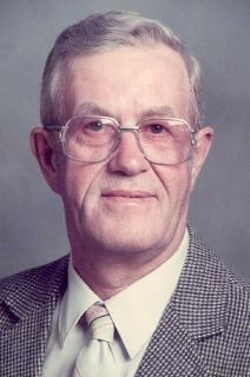 Merlin K. Ahrendsen, 87, of Olin, died Monday, December 6, 2010, at Jones Regional Medical Center in Anamosa. A celebration of his life service was held on Thursday, December 9, 2010, at 10:30 a.m. at Lahey Funeral Home in Olin. Friends called from 4 to 7 p.m. Wednesday at Lahey Funeral Home in Olin. Burial was held in the Olin Cemetery, Olin, Iowa. Merlin K. Ahrendsen was born April 8, 1923, in rural Olin, Iowa, son of August and Irma (Nissen) Ahrendsen. He graduated from Olin High School in 1941. He married Leona "Jeanne" Engelbart on December 14, 1945, at the Wayne Zion Methodist Church in Monticello, Iowa. He farmed many years, worked at Gray's Cashway Lumber in Olin, and was a groundskeeper for Wapsipinicon State Park for seventeen years. He was a member of the Olin Community United Methodist Church. Merlin loved to drink coffee and play euchre with his friends in the afternoon. Merlin is survived by his wife, Leona "Jeanne" Ahrendsen of Olin; his children Linda (Charles) Abel of Coralville, Brad Ahrendsen of Olin, Brian (Sara) Ahrendsen of North Liberty and Jill (Greg) Eganhouse of Olin; ten grandchildren, eight great-grandchildren; and three brothers, Lowell (Wanda) Ahrendsen of Rochester, New York, Norman (Marge) Ahrendsen of Anamosa and Gayle (Pauline) Ahrendsen of Monticello.